It's going to be a big storm - there's no doubt about that. The question is how bad will it be here in Connecticut as it moves north. That's an open question. Above is the National Weather Service rainfall forecast showing a widespread 3"-4" of rain across the region. But that's by no means a sure bet. 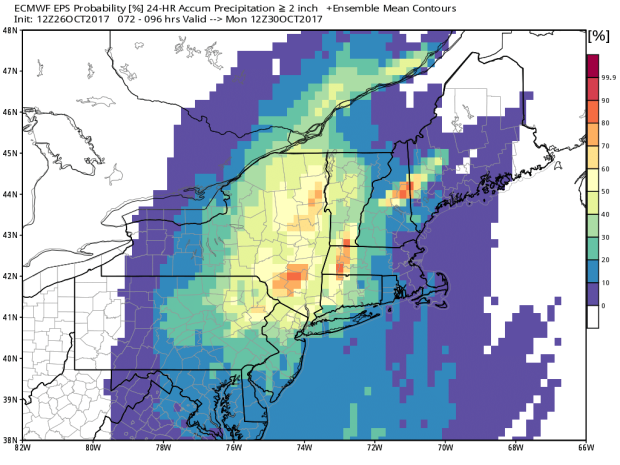 Take a look at the European Ensemble probabilities for over 2 inches of rain. With the exception of the Litchfield Hills the odds are less than 50/50. The amount of rain is highly dependent on the storm's track as it comes north. How far east or how far west. We just don't know yet but there is the potential for high end totals given the amount of tropical moisture involved AND the amount of lift in the atmosphere. The second question left is the potential for strong damaging winds. We have an old fashioned Euro vs GFS battle going on here. The American model develops the storm a bit later than it's European counterpart. It's weaker and farther east. 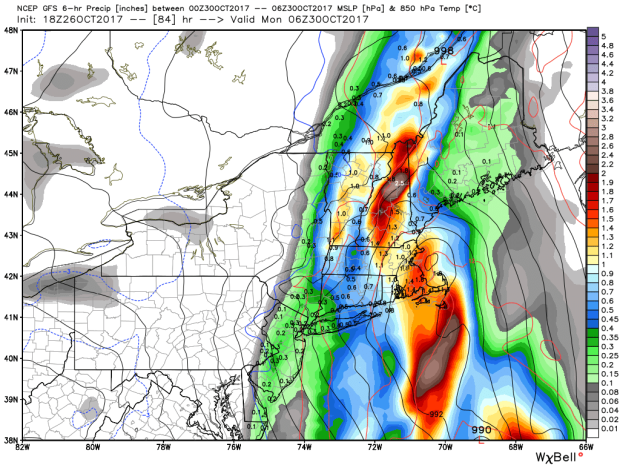 This would shift the damaging wind threat well north and east of Connecticut. The European model has the storm nearing peak intensity just west of us which would introduce the potential for 60 mph wind gusts. GFS solution is weaker and farther east. While we would still get heavy rain from this setup (1"-3") the wind impacts would be minor. The Euro is much stronger and farther west. Heavy rain (1"-3") and damaging winds (up to 60 mph) would be likely in this scenario. 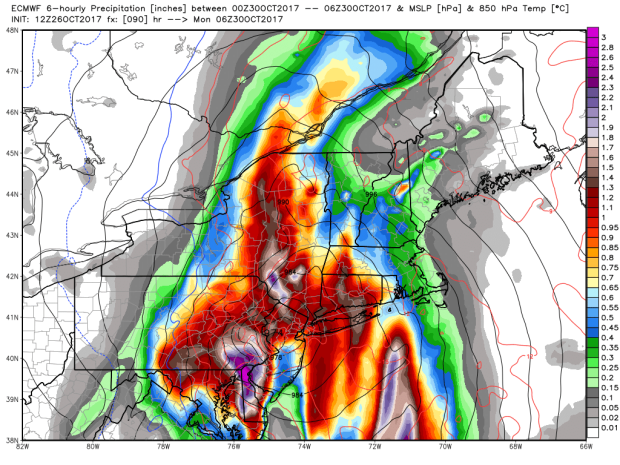 The heaviest rain (possibly over 6") would be likely in eastern New York. In the end it's hard to know which model will be right. Both seem like reasonable solutions and both are supported to varying extents by their ensemble members. Keep in mind that this storm is the result of a complex interaction of tropical moisuture from the Caribbean and a bit jet stream distrbance diving south from Canada. There's a lot that can go wrong. 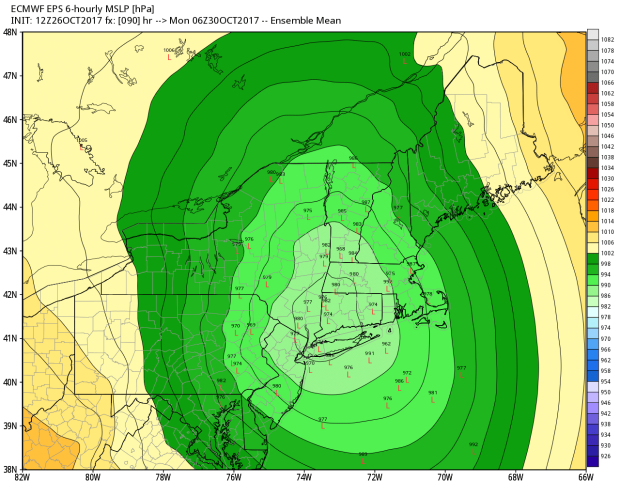 A way to visualize the possible scenarios is to look at the Euro Ensemble surface low positions late Sunday night. Each "L" represents one of 51 European model solutions with each number indicating the strength. There are some super deep and powerful storms and some that aren't all that impressive. Some storms are as far west as Pennsylvania and some storms are off the Cape! We need the model spread to shrink in order to get more specific. For now be prepared for damaging winds and the potential for flooding on Sunday. While both are possible they are by no means guaranteed. We've erased our yearly rainfall deficits after this week's rain so I'm OK with a more tame Sunday storm!